One of the most remarkable things about Christianity is the worship of Jesus as God. One of our recent commentators, KG, takes the not uncommon view that the Trinity (which is how Christianity sees God) is the result of the infusion and influence of Graeco-Roman influences across the centuries leading up to Nicaea; in short, that the idea is of Platonic origin and therefore not from Semitic sources at all; it is, to him part of a repudiation by Christians of their Jewish inheritance and origins. This is not an uncommon view. It comes from what is, after all, a remarkable phenomenon – that Judaism is a Monotheistic religion and yet Christianity sees God as being the Trinity; one way of explaining it is the input of non-Jewish thought. One problem with this is chronological. From very early on, Christians have given to Christ the kind of worship which a Monotheistic religion gives only to God, and these early Christians were Jewish, and the chronology we are dealing with is not, as we shall see, centuries, by decades; that being so, where would observant, Monotheistic Jews, have derived the view of Jesus as ‘Logos’. One answer to this is the ‘wisdom Literature’ of the Old Testament, where we often see some figure acting as God’s principal agent – sometimes a great angel such as Michael, sometimes a human figure such as Moses or Enoch, and sometimes by one of God’s own attributes such as Divine Wisdom or God’s Word personified. in his God crucified: Monotheism and Christianity, Richard Baukham has argued that the worship of Jesus was the cosequence of the belief of the early Christians that Jesus shared in ‘the Divine identity’, the key features of which were God’s unique roles as creator of all and ruler of all. Since their own teaching was that Jesus had uniquely partaken in th creation of all things (1 Corinthians 8:6; Hebrews 1:2; Colossians 1:15-17 and John 1:1-3) and now shared the Divine Throne as the ruler of all, to whom every knee should bow (Philippians 2:9-11), it was natural to extend that worship to Jesus. Here we find purely Jewish roots for the worship of Jesus, but also part of the puzzle that prompts men like KG to look outside of Judaism for the origin of what becomes known as the Trinity. The Second Temple Jews were Monotheists, this marked them out from the culture which surrounded them, and however interpenetrated their culture was with aspects of Greco-Roman culture, on this issue they were separate: they were monotheists. But here, Backham and others do two things: they correctly identify that from the very beginning Christians who were Jews, gave Christ the sort of worship reserved only for God, and yet saw no problem with that and their own Monotheism. They did not see themselves as worshipping two Gods – God and Jesus – they saw that in some way the Father and the Son were one. 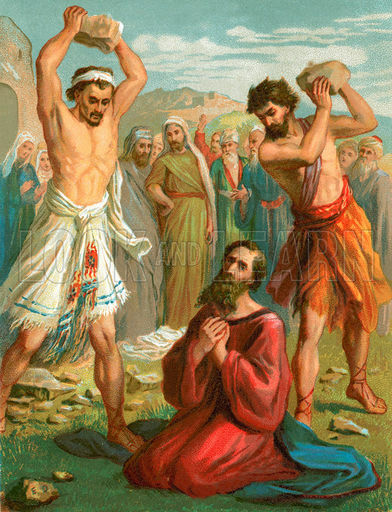 But, just as some Jews had stoned Jesus for saying this, because they thought it blasphemy, so too, it seems, did they stone some of His followers. Christians were saying from the start that Jesus and God were one; they had, at this early stage, not articulated how this could be, but they knew it was so, and they taught it, and for that they were persecuted. One the most zealous of these Second Temple Jews was a man called Saul of Tarsus. A faithful Jew, he could see, as many other Jews could see, that to give Jesus the worship rightly offered to God was blasphemy. He set out to help extirpate this blasphemy. Whence this strange belief had come, he did not say, but the idea that it was the product of centuries of evolution and of outside influences was not one of them. There had arisen, within Second Temple Judaism, the idea that a man called Jesus was in some way to be identified with the Creator of Heaven and Earth and was to be accorded the same worship. This was incompatible with what orthodox Jews believed. Saul was on his way to Damascus to root out a nest of these vipers when he discovered for himself where the idea really came from. It is to that story we must now turn. “They use the same words, but without knowing what they mean by those words, we cannot know whether they are referring” (Written in the post “The God of Abraham”). As far as I understood, we need to start by examining the different meaning of the words “Son of god” by the ancient biblical Hebrew language and the translation to the Graeco-Roman culture. Without giving it much thought it is clear that the term ‘son of God’ is used in scripture for Adam, Angels and Christian disciples obviously the term applied here does not imply deity and I suspect the term son of God in reference to the Messiah did not imply deity to the Jewish mind either. However the gospels, epistles and Revelation attribute to Christ divine attributes, titles and functions while numerous OT texts directly referring the Yahweh are directly referred to Jesus in the NT. Thomas’ post resurrection worship of Jesus seems to me to be the first irrefutable recorded acknowledgement / recognition of His deity. When on occasion apostles or angels were offered such worship it was always refuses sometimes with the instruction to worship God. But Jesus received Thomas’ worship and as a result commended him for it while instructing us that if ‘without seeing’ we have the same faith we will be blessed.